Gives a good background on the subject you are discussing here, the article discusses the US but is applicable here. Edwin Vieira is a smart guy. Thx JMD, will take a look. Anything you come across – worldwide – on this theme, please do keep me advised. Much appreciated. You understand that when bonds mature, the Government repays the debt and the stock falls, right? Charts 1 and 2 might benefit from highlighting the volume of debt that has matured through time, but why let accuracy get in the way of a good story, huh? Yes, Abe, I do understand the issue of bond maturities. However, your inference that somehow not capturing maturities renders those two charts inaccurate, is simply flat wrong. As stated in my response to your comment at another post, pointing to the government’s paying out on previously-issued debt on maturity – as they are legally obliged to do – wilfully overlooks the reality that they are effectively just rolling over old debt, by continually creating even more new debt. 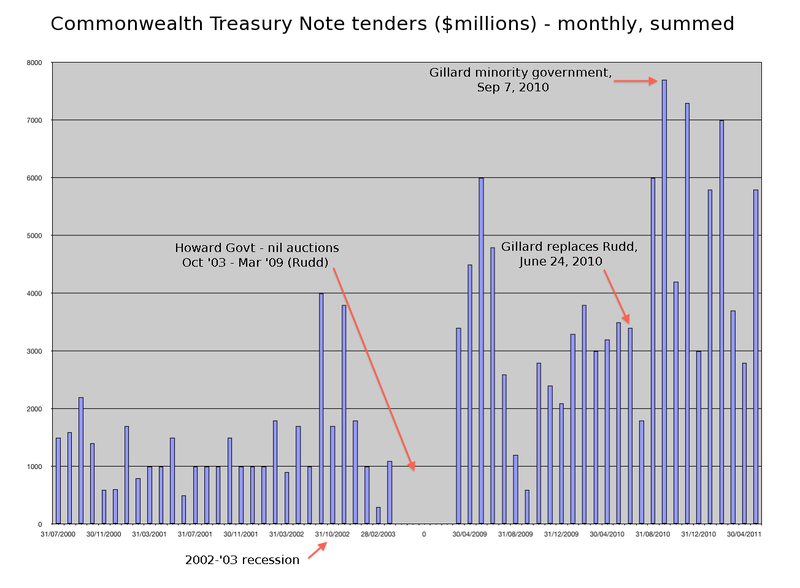 Hence, why the total of Commonwealth Government Securities on issue continues inexorably to rise. The total is the number that matters. 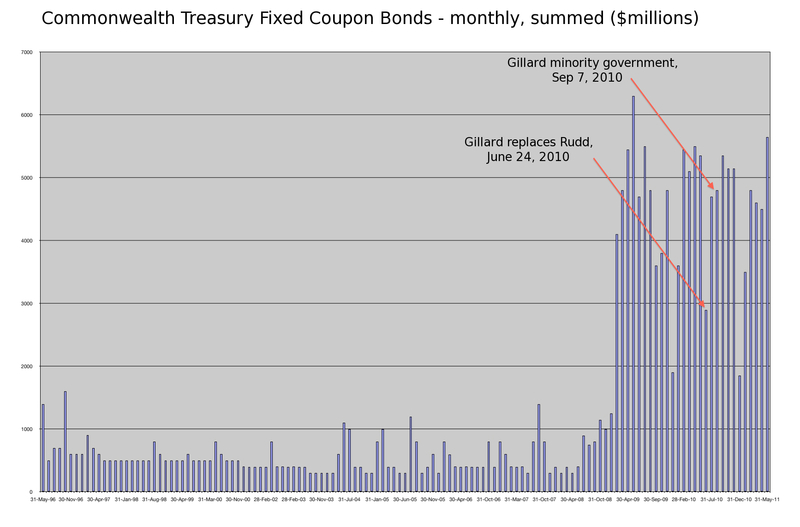 The charts are perfectly accurate, and well capture the overall context – a government that, compared with the previous 15 years plus, has embarked on a massive borrow-and-spendathon, and has thus lumped the taxpayer with an annual Interest-on-debt bill that the history of past budget surpluses suggests is unlikely to ever be met. If they can’t find a surplus big enough to pay the interest-only, then they cannot pay the principal. 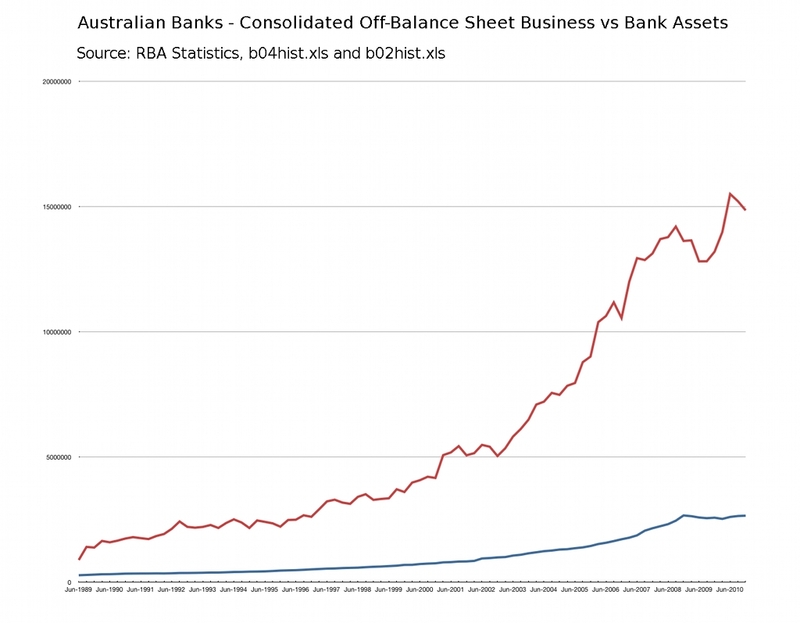 I note with particular interest that you have tried (unsuccessfully) to blur the issue regarding CGS only, and failed to address either the Interest-on-debt issue – which is from the government’s own budget “forecasts” – or, the issue of Australia’s massive banking systemic exposure to derivatives. If you want to make a relevant, topical, informed point to help increase readers understanding of the key issue/s, then you’re welcome here. If you merely wish to troll .. as seems evident so far .. then you are not. Well I made both comments (and another) tonight, because you seem to be making the same point on a regular basis. But nowhere am I saying that debt isn’t rising. I’m simply pointing out that the movement in the stock of debt is a more meaningful measure than half of the flow story. The measure you are using, would, for example, be disorted by a decision by the AOFM to issue 1 month TNotes rather than 3 month TNotes, wouldn’t it? Thanks Abe, that’s a good, considered observation/question. However, I disagree with you on this particular point (stock vs flow relative importance). From my perspective, the flow is the more important measure, because it points to (and highlights) what I consider the most important point of all. And the one I am primarily focussed on here at this blog. Serviceability of the debt, (ie), how much Interest are we paying, and does it appear likely that we can pay it .. especially in the event of a China slowdown/meltdown. If I were to only look at stocks, or indeed to complicate matters by charting both, then (a) most readers would be lost from Day 1, and (b) it would fail to emphasise the key underlying point I wish to make, which is how much Interest have we paid / must we pay in future, due to the total government debt that has been issued. In that context, the question of maturity flows (or, per your question, varied debt term issuance) is, in my opinion and particularly vis-a-vis the core message / warning I am trying to convey, irrelevant. Then I think we are in violent agreement about the stock being the relevant measure. Perhaps in future, you might care to plot it for your readers, rather than half of the flow measure. That said, your chart 4 is quite telling although I would note that your interest plot is that of interest on gross debt, rather than net interest payments. A minor point, granted. As I said Abe, the issued “flows” are the best pointer to how much total Interest burden is inflicted on the taxpayer. If the T-bond or T-note has been issued and not yet matured, then the Interest is owed. If a previously issued “flow” has now matured, then the Interest has been spent. 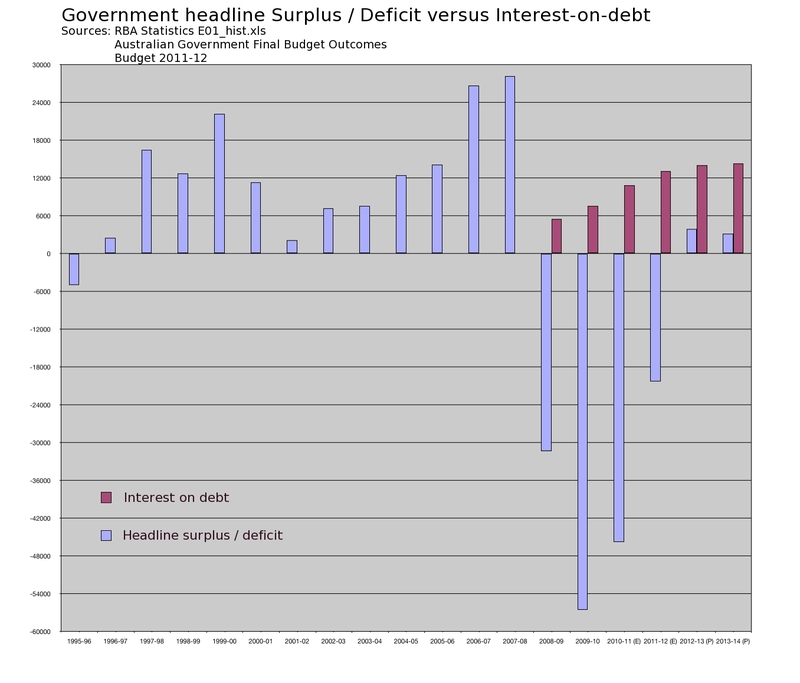 And I have captured that in the 4th chart (ie, years 2008-09 and 2009-10 Final Budget Outcome Interest-on-debt figures). There is no inaccuracy, and nothing misleading about the way in which I have presented the information. It’s a curious point you mention, re. gross versus net Interest payments. IMO, that in itself is a pointer to the deceitfulness of all sides of politics, in their picking and choosing their refs to “gross” or “net” figures, purely depending on which side of the House they’re sitting on at the time. My firm view is that, when it comes to debt, the gross figure is always the only one that matters. End of story. Why? It’s all well and good to try and claim that you don’t really owe X (ie, the gross figure), because other people owe you money, and you prefer to imagine you can reduce what you owe by what you are owed. The fallacy of that viewpoint is that it assumes those who owe you money, can/will pay up. Something that is beyond our control, otherwise known as “counting your chickens before they’re hatched”. All we can control is how much we owe. And that is dependent on the gross level of debt we take on.